The big differences between binary and digital option trades is the classification of ‘strikes.’ A ‘strike’ is considered an entry point into the market. When trading binary options, a strike is the position or a price at which the traders enter into the market. In Digital options, traders have the choice of choosing the most profitable strike. So, they (traders) have seemingly more control over their entry. Traders can choose from 22 possible ‘strikes’ at any time during a trading day. However, the number of ‘strikes’ available can vary mainly depending on the market situation and the type of chart. A trader’s profit in the digital options industry is largely based on risk. Though traders can end up making as much as 900% profit on an upswing. Having the ability to buy multiple trading options which expire at any time, in addition to as many ‘strikes’ opens up traders to a whole new avenue of possibilities. When trading digital options traders can also open positions in advance. 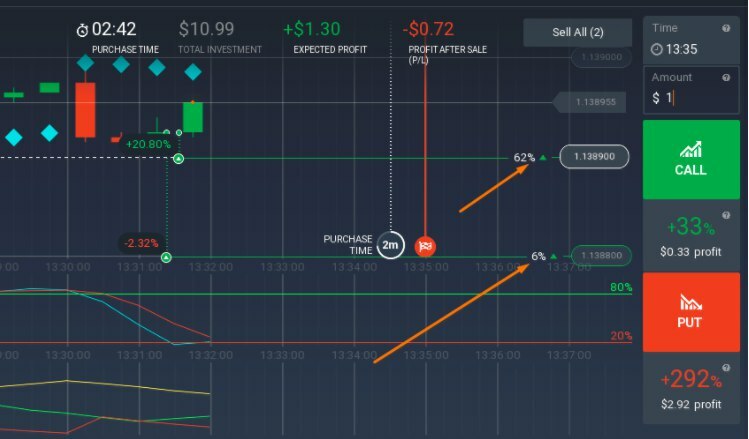 So, traders can automatically enter the market at a time when they think is most profitable. Though they may yield a comparatively lower profit owing to the risks when compared to regular trading options. Like all other trading options, a trader also has the ability to sell his or her position prior to expiration. However, it shouldn’t be any later than 20 seconds before a transaction ends. Plus it also is highly dependent on the current pricing which can either mean that they end in profit or get part of the funds they invested back.